Rwanda Development Board has launched Kwita Izina activities a head of the official event scheduled on September 1, as the board kick start the World Tourism month. This year’s event marks the 13th edition of the annual event that attracts thousands of tourists from across the globe to celebrate the country’s success in protecting the endangered primates. According to RDB’s Chief Tourism Officer, Belise Kariza, this year’s event is a confirmation of the country’s focus in enhancing awareness on sustainably maintaining biodiversity. “Rwanda’s tourism journey has been more rewarding because of the involvement of local communities within the entire sector in the past decade,” Kariza said told reporters on Wednesday. Tourism is Rwanda’s biggest foreign-exchange earner and contributes about 115 to the $8 billion economy. “We are targeting $440 million from tourism sector this year compared to $404 million collected in 2016 from 1.4 million visitors,” Kariza said. Gorilla tourism remains the backbone of Rwanda’s tourism and conservation industry, and the board pledges to continue to leverage on platforms such as Kwita Izina by joining hands with experts in conservation to ensure the long term sustainability of endangered species. Last month, RDB hiked gorilla trekking tariff to $1,500 from $750, and according to Kariza, the increase in rates hasn’t affected the number of gorilla trekking permits sold. “We have not been affect by the hike of the tariff because there is a unique group of tourists who understood that the hike was about protecting conservation,” she explained. Normally Rwanda issues only 80 single permits per day to visit the gorillas, limiting groups to 10 people. Last year alone RDB sold out 22,219 permits. 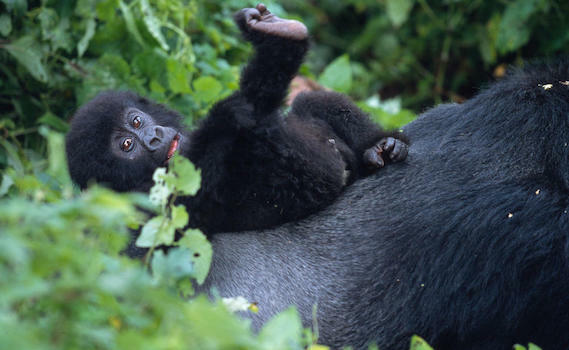 Since the launch of Kwita Izina in 2005, a total of 239 mountain baby gorillas have been named. The success has been unmatched and this year RDB expects over and above positive outcomes. According to RDB officials, as a way of promoting local tourism, they are launching a domestic tourism campaign dubbed “Tembera U Rwanda’ following Kwita Izina 2017, where a mini draw promotion event will be held on July 4. Lucky winners will be gifted with an opportunity to visit the gorillas in November 2017.